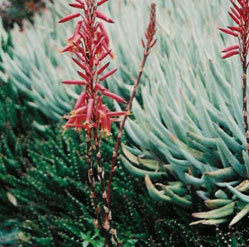 This succulent perennial will only grow 1' tall and 1' wide. It has large, sharp, dark green leaves and clusters of red-orange flowers that bloom in summer. Planting Instructions: 1. Dig a hole 2 times the width and 1 and 1/2 times the height of the container. 2. Set rootball at ground level. 3. Prepare soil mix of equal parts soil and soil amendment. 4. Backfill with amended soil. 5. Build Basin and water.